Posted by peter88 from the Agriculture category at 24 Sep 2017 08:31:27 am. On the surface, it seems almost foolish that a horse should be shod with a hard, metal disk on each of its hooves. After all, if animals were meant to wear shoes wouldn't we see cheetahs wearing running sneakers or dogs donning boots? Although it may seem odd, horseshoes provide protection to animals who are used as working horses. Working horses are those that are asked to carry riders, pull farm equipment and do different tasks that a wild horse does not. There are distinct differences between domesticated working horses and their wild counterparts, which is why domestic horses are fitted with shoes. In the wild, horses walk long distances to find acceptable grazing pastures. Trekking so far across different types of terrain naturally hardens the horses' hooves. Furthermore, eating wild vegetation provides certain nutrients essential to strengthening hooves and keeping them healthy. Domestic horses walk far less than their wild cousins. Also, commercial feed provided to them does not have the same level of nutrients necessary to properly strengthen hooves. The added weight of riders or gear can put strain on horse hooves. To help alleviate that, different horseshoes are used depending on the type of work the horse does. The person who does shoeing on a horse is called a farrier. The farrier's tools and apron have remained unchanged for years. The farrier often goes to the horse to do his work. Shoeing can be done hot or cold, but the cold process requires horseshoes be custom-made at another location. Hot shoeing allows the farrier to custom mold shoes on the premises. While the horse shoeing process may look painful for the horse, in essence it's just like getting a pedicure. An experienced farrier knows what to do to make a horse comfortable and prevent any pain. Here's a general synopsis of what's done with a shoeing. 1. The old shoe is removed by straightening the clenches, or the nails that have been bent to secure the shoe. Once straight, the shoe is removed with pincers. 2. The farrier then trims, levels and cleans the hoof with cutters and a rasp. 3. The farrier will then take one of his variety of horseshoes that will be a close fit for the hoof and heat it (in hot shoeing) in a forge. The hot shoe is placed up against the horse's hoof to determine if modifications must be made. 4. The shoe is worked and reworked until the shape is ideal. This may take several go-arounds. 5. The new shoe is then nailed to the hoof. Most of the time seven nails are used, and they are driven toward the outside of the hoof so part of the nails poke through. The excess is cut off and the top part of the nails are bent down to form clenches. There are many different types of horseshoes for particular tasks. 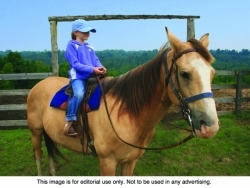 These include shoes for trail riding, jumping, racing, and even therapy for horses that may otherwise go lame. Although shoeing has many advantages, the fact remains that nails must be driven into the hoof, which can damage some of the fibers of the horn. Shoes also confine the hoof to one shape, preventing it from naturally being able to flex under weight. Inexperienced farriers may hurt a horse by causing pain or damaging tender tissues in the foot. All in all, working horses generally benefit from wearing shoes. Many people find that watching a farrier at work is a spectacle worthy of witnessing.